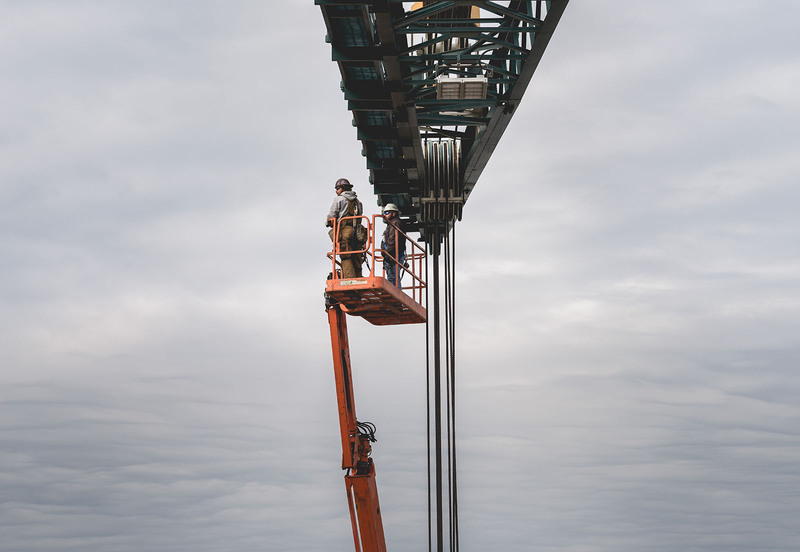 Shipbuilders share a lift while inspecting work on a South Yard crane. The upper bow section of John F. Kennedy (CVN 79) resembles an inverted pyramid while resting on the platen awaiting its lift into the dry dock. The caisson gate at Dry Dock 12 holds the James River back. A distant view of John F. Kennedy (CVN 79) under construction in Dry Dock 12 is visible from the top of a shipyard crane. Shipbuilders at Pier 5 watch as USS Boise (SSN 764) arrives at Newport News Shipbuilding for scheduled overhaul work. Night descends on the North Yard as construction of John F. Kennedy (CVN 79) continues. John F. Kennedy’s (CVN 79) lower bow unit waits to be transported into Dry Dock 12. A straddle carrier moves through the Foundry. Ventilation piping helps to purify the air in the Foundry. Shipbuilders Travis Harper, left, and Charles Apple rig a mold for a lift in the Foundry. A status board remains frozen in time on the decommissioned Enterprise (CVN 65). The crane at Pier 5 stands tall on a cloudy summer day. A pile of chains rest beside Dry Dock 12. Shipbuilders Jeffery Harris and Jeremiah Workman secure Dry Dock 12 gate to shore. Water bags hang from a crane inside the Steel Production Facility. Every four to five years, cranes in this facility undergo testing with large water bags to ensure lifting capabilities. During testing, four bags hang from a single crane holding approximately 28,000 gallons of water equivalent to 243,000 lbs. Hand signals are given to the crane operator above, who positions the ladle over the mold for the pour in the Foundry. Rope in the South Yard sits at the entrance of Pier 3. 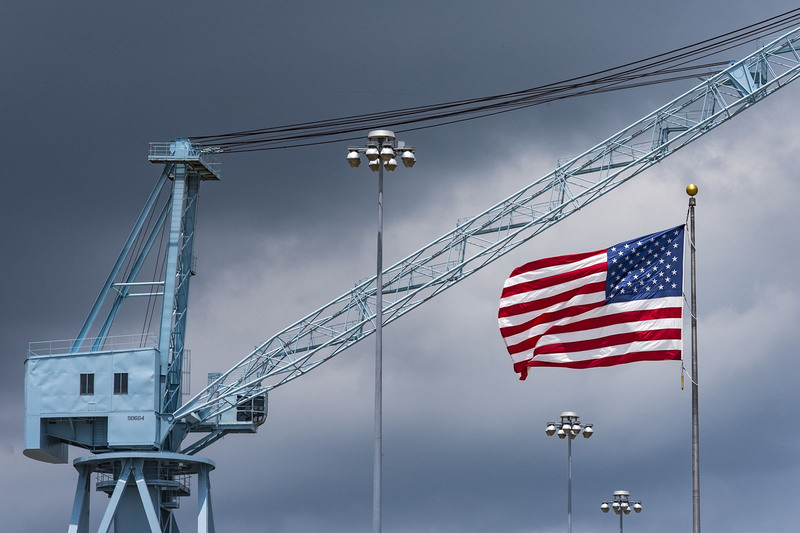 The American flag flies proudly above Outfitting Berth 1 (OB1) in the North Yard.